You’ll be guided through our historical cellars of the XV century to learn the history of Lornano winery and our sustainable technique of agriculture. Tour ends with a wine tasting. • Tasting of 3 Lornano wines. In addition to the wine tasting and cellars visit, enjoy a selection of typical and delicious Tuscan products like Pecorino, Salame and farmer’s bread to combine your wine tasting. Tour of the historic cellars. • Tasting of 3 wines. • Tasting of Extravergine Olive Oil. • Tour of the historic cellar. • Taste of pecorino cheese, ham, salame and bruschetta. About 1.30 h *Just on reservation – the tour includes 20 minutes walking. A classy tasting in the historic park of the XIX century Lornano villa at sunset with breathtaking view of chianti hills at sunset. • Tasting of 4 wines. Enjoy a typical Tuscan light lunch at the winery and experience the emotions that the right combination food/wine can offer to our palate. 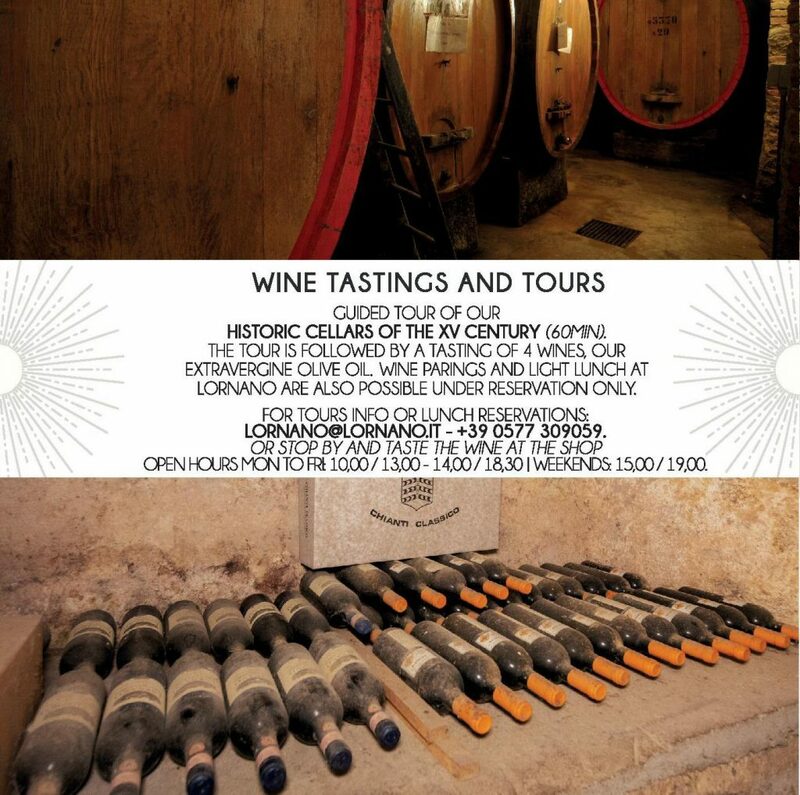 Before the lunch pay a visit to historical cellars and learn the history of our winery. • Tasting of 4 wines + Vinsato. • Light Lunch Menu (1 starter 1 plate 1 dessert): Starter as ham, salame, pecorino cheese and bruschetta; First plate like pasta or lasagne; Vinsanto and Cantucci as dessert. About 1.45 h *Just on reservation. We can customize your light lunch with menus and tastings tailored to your needs. Contact us for more information.